SUMMARY: Swiftech’s MCX478 dominates PIV cooling. I’ve been spending some time reading up on Intel’s PIV tech docs and decided to modify a PIV 1500 to serve as a PIV heatsink testbed per Intel’s testing specification. This, coupled with the CPU Die Simulator, should give PIV fans a good performance perspective. I have taken the PIV heatsinks that I still have and retested them with the modified PIV 1500. 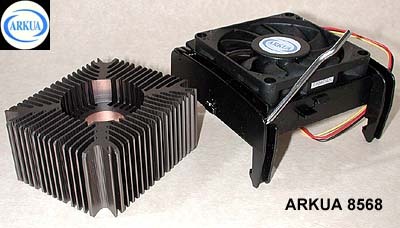 For a detailed look at each heatsink, click on the name to link to the review. All of the heatsinks tested are aluminum except for the copper cored ARKUA and the Swiftech MCX478 (a 462 with a PIV mod), which features a copper base. Intel’s retail heatsink is a pain to put on and especially a pain to take off – Intel clearly designed this to stay on. It’s very quiet – it did not measure on the Radio Shack sound meter that I use. Note that as case temps increase, fan speed increases as well. Dimensions: 90 x 90 x 72; Weight 350 gm; Fan 70mm, 32 cfm @ 4500 rpm; the lever is used to hold the heatsink to the base. The ARKUA uses the standard PIV retention base and is fairly easy to mount and dismount. It features a copper core. The ARKUA’s base does not fully cover PIV’s case. Heatsink 88x60x35mm; Weight 257 gm; Fan 60mm, 24 cfm @ 5,300 rpm. 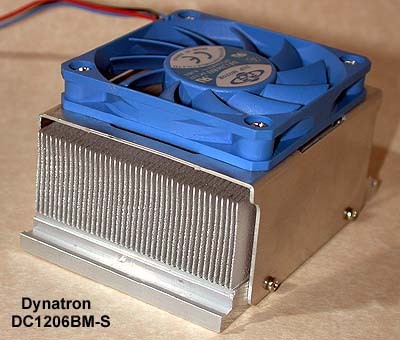 The Dynatron is a skived heatsink – the fins are literally shaved from the base. The fan is a relatively tame 60mm, so I also tested it with a Delta 38. It uses it’s own retention base, so you must remove the motherboard to mount it. Once the base is in place, it’s extremely easy to mount and dismount. Heatsink 83 x 69 x 53mm; Weight 303 gm; Fan 70mm, 42 cfm @ 5,000 rpm. The Glacial Tech Igloo 4300 is an aluminum extrusion unit. The mounting mechanism uses the standard retention base and is fairly easy to mount and dismount. Dimensions: 3 x 3 x 3.2 inches; Weight: 730 gm with fan, 560 gm without fan. The Swiftech is the largest and heaviest of the bunch. It mounts on the board with its own spring-loaded bolts; this requires removal of the motherboard to mount. If you plan to dismount it, unless you secure the mounting bolts on the motherboard with something like Loctite, you will have to remove the motherboard. Dimensions:83 x 70 x 70mm; Weight 380 gm; Fan 70mm, 38 cfm @ 5000 rpm. The Vantec is an aluminum extrusion unit. The mounting mechanism uses the standard retention base and is easy to use. 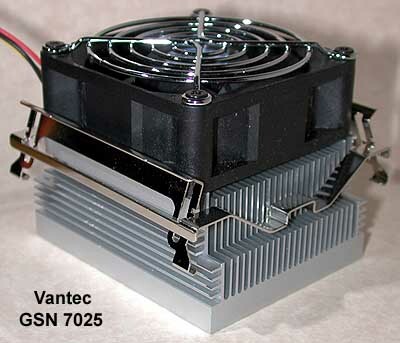 The PIV heatsinks were tested per the Intel Specification for Heatsink Testing. I have modified a PIV 1500 (57.9 watts) which allows me to read directly PIV Case Temperatures with a thermocouple. The thermocouple is attached to an Omega HH23 Digital Thermometer. Ambient temps were measured with a thermocouple placed about 1 inch from the fan’s intake. I used Prime 95 to stress the CPU on a Lucky Star P4A845D. Arctic Silver grease was used in all tests. CPU Case Temp is the temp at that point where the CPU contacts the heatsink and MBM Temps are Motherboard Monitor readings from the PIV internal diode. In addition, heatsinks were tested on the Simulated CPU Die Tester. This is the “purest” test of a heatsink’s performance as extraneous factors, such as secondary heat path effects, are not included, which may or may not be beneficial to performance. 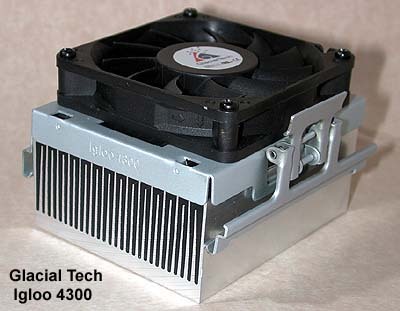 Heatsinks with high airflow, for example, will generally perform better on motherboards due to higher secondary path cooling on the motherboard. Substituting a noisy Delta 38 boosted the Dynatron up quite a bit, next to the much larger Swiftech MCX478. Overall, substantially besting Intel’s retail heatsink will take some effort. Swiftech dominates the PIV heatsinks tested to date, as it does for Socket A. I think you’re going to see more copper solutions as users start pushing the PIV to the max.